I’m not even talking about how physically demanding the hiking trail is. I’ll get to that later. What I really mean is that half of the coastal trail is closed, and apparently has been for years. This includes the famous Via Dell’Amore, which I’m sure is a huge let down for the Pinterest travellers. Personally, I didn’t mind at all, because hiking the remaining two sections of the Sentiero Azzuro, the Azure Trail, was more than enough hiking for my one day visit. 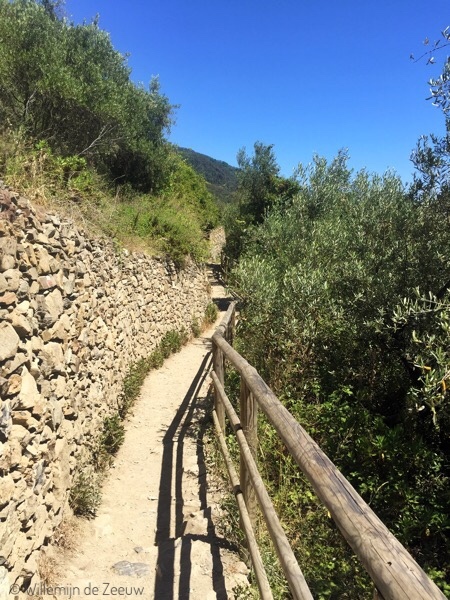 If you have your heart set on hiking the entire way from Monterosso al Mare to Riomaggiore, you’ll have to follow the red trails, which are higher up in the mountains. Alternatively, you can just take the train to visit the southernmost towns. As mentioned in the above paragraph, the trail is not exactly a stroll through the park. The landscape consists mainly of mountains and cliffs with the villages wedged in between them. This causes the hiking trail to ascend quite a bit, mostly with uneven stone stairs. 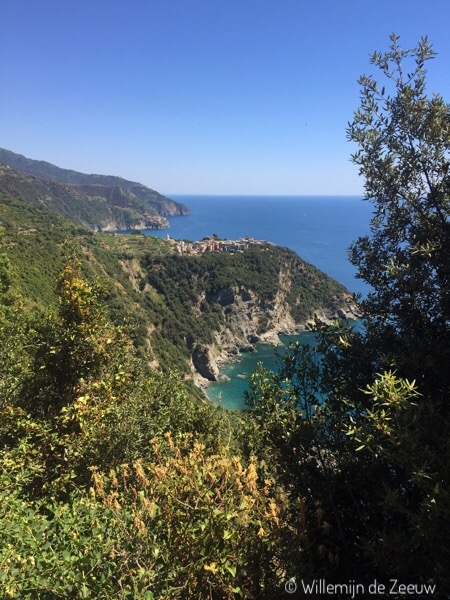 Shortly after departing Monterosso al Mare, there is a steep climb through the vineyards. The view is stunning, as you can see in the header image of this post, but the climb is incredibly exhausting. The descent is not any less demanding, as the steps can be quite high and there are plenty of loose rocks. The second part of the Azure Trail – from Vernazza to Corniglia – climbs even higher, to an altitude of about 200 metres. This path does not descend as much, since Corniglia is the only one of the five towns that is perched on a cliff. The path doesn’t reach sea level at this town, unless you want to go to the train station. Although the hiking trail is very demanding (my phone’s health app counted 136 flights of stairs on this day), it is more than worth it. The views are more stunning than I could have possibly imagined and let’s be honest: if I can do it on a sunny 33°C day, pretty much anyone can pull it off. Just don’t forget to bring sun cream and make sure to bring lots of water; one small bottle isn’t going to be enough on this dusty, hot path. I have seen too many websites recommending that people go in April, May or September to avoid the busy and hot summer months. Although the temperature is indeed more friendly during those months, I wouldn’t want to discourage anyone from visiting if their only option was the summer. Besides, I really wouldn’t want to be on this hiking trail when it rains. As much as I started to dislike the dust after a couple of hours of hiking, I wouldn’t feel very safe on those cliffs if that dust turned into mud. Although it was much more touristic than I had thought (I was especially suprised to encounter so many American tourists here), I didn’t find the hiking trail to be crowded. Granted, if you’re looking for solitude, this is not the hike for you, and perhaps July and August are busier months than June. However, the number of fellow hikers didn’t bother me at all. Sure, there are some narrow sections where it’s required to wait for people coming in the opposite direction, but that just gives you a moment to breathe before you continue. I only skipped one of the five towns: Manarola. 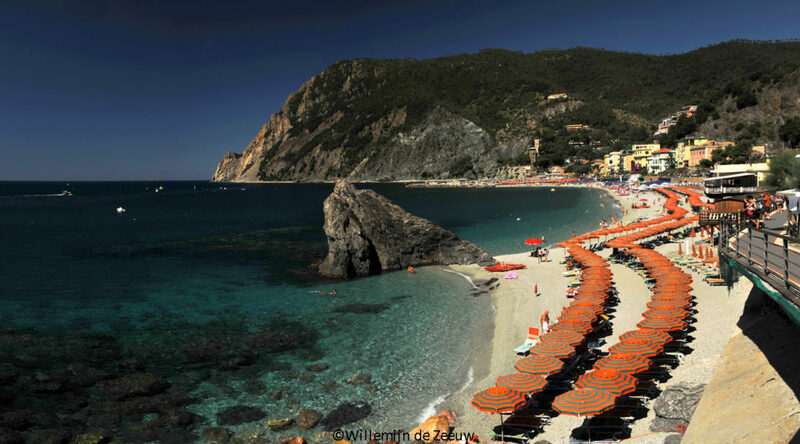 I didn’t see much of Monterosso al Mare, apart from the walk from the train station, along the boulevard, to the start of the hiking trail. This town is beautiful, but quite different from the others; it’s more touristic and looks a bit more like a beach resort town than an old village. After the first hike, I had a well deserved long lunch break in Vernazza. The seafood here is incredible and it’s a lot of fun to just sit on some steps and spend half an hour watching all the people. The second hike, to Corniglia, was significantly harder due to the higher climb and the hot afternoon sun, but the views were better. I spent some time exploring the village and enjoyed a refreshing gelato. Last, but certainly not least, I visited Riomaggiore by train. I didn’t really have any energy left to explore the whole town, so after a small walk around, I sat down for a drink and reflected on my day, before returning to the campsite.